Enter into the story of Twelve chosen men who had humble, silent simplicity. They traveled their known world with a faith strong enough to move mountains, tame nature, and compel angels to sing. These Twelve embarked upon a human adventure matched only by their certainty in God and His will. Their spoken words echo to this day, for they moved with a love as great as that same love found in the first days of creation. Their belief and devotion in their Lord, and His command, eventually brought them face-to-face with their own Gethsemane and Golgotha. 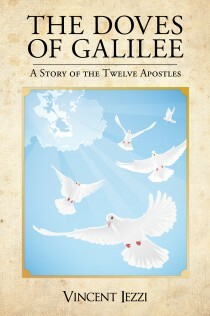 With surety of purpose and undeterred devoutness, the Twelve Apostles soared the sky as gentle doves, carrying the Spirit of God to all. This is the author’s fifth novel. He authored Coffee with Nonna and its sequel, More Coffee with Nonna. Iezzi was born and educated in Philadelphia, where he presently lives with his wife of more than 50 years, two sons and daughters-in-law, and eight grandchildren.